We are proud that our esteemed Institution has been selected as the Hub under Innovation & Entrepreneurship Programme for Universities/ Colleges/ Polytechnics/ITIs on 22.11.2016 by the IEDP of EDII Chennai, the apex body of the Govt. of Tamilnadu for Entrepreneurship Development. The main objective of the Hub is to support spoke colleges who are willing to come forward to implement IEDP activities. Sona College of Technology identified around 31 Colleges, Polytechnics in and around Salem within 50 – 100 km radius. 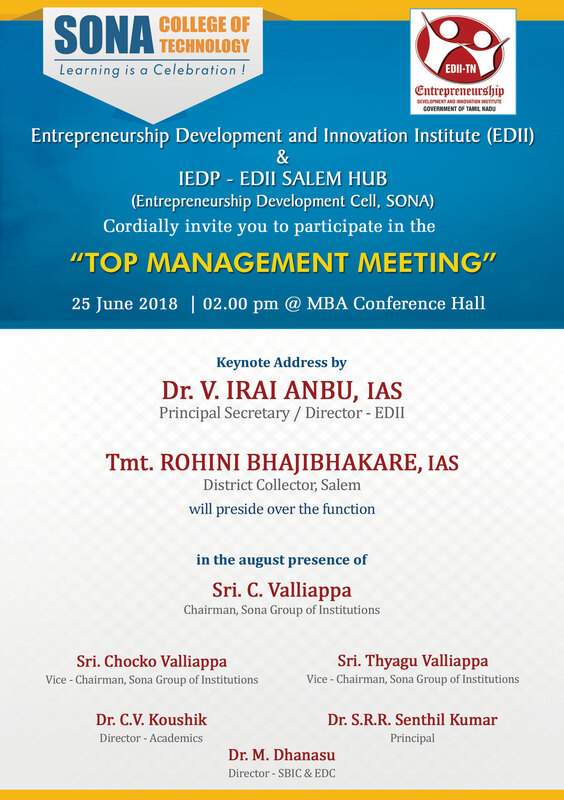 To promote innovation and Entrepreneurship eco-system in this region, the top management meeting was conducted on 25.06.2018 in EDII Salem Hub-Sona College of Technology. Dr.V.Iraianbu, the Principal Secretary & Director EDII, headed and District Collector, Salem Ms.Rohini Bhajibhakare presided over the meeting. 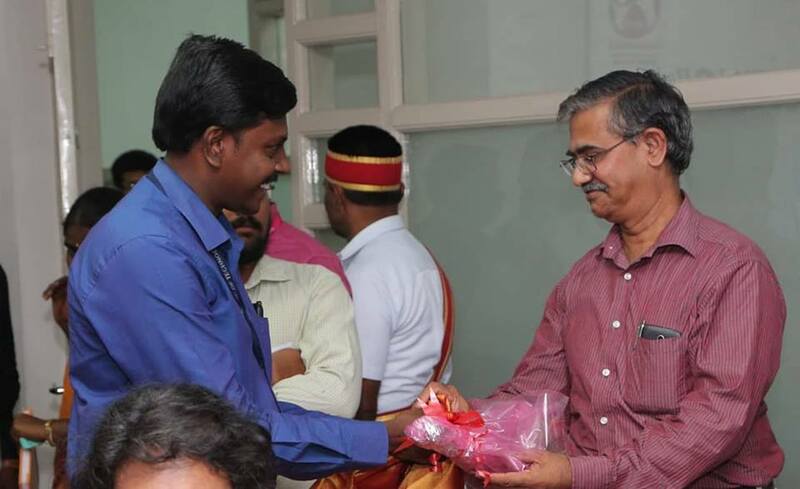 The Vice Chairman Shri Thyagu Valliappa, delivered the inaugural address while Principal welcomed the gathering. 43 participants (Management/Head of Institutions/ Representative) from spoke Institutions have attended the meeting. Shri Thyagu Valliappa, the Vice Chairman, explained about initiatives taken for entrepreneurship development among students, and rural areas particularly the stationaries made out of recycled waste paper by rural women through Women Technology Park (WTP) which is supported by Sona College of Technology. The heads of spoke institutions interacted with Director EDII and District Collector Salem on strengthening of entrepreneurship development and creating the awareness to the not only students but also to their parents. The District Collector, Salem Ms Rohini Bhajibhakare had insisted upon responsibility of the institutions to bring the industries into their portals to give adequate exposure to the students. The director EDII, Dr.V.Irai Anbu expressed the much effort is required for developing Tamil Nadu into a hub for innovation and entrepreneurship. He said that the academia, industry and government should join together for the success of the incubation cell. He underlined the importance of creating confidence among the student community and makes them believe that they naturally acquired entrepreneurship qualities. The colleges should provide opportunity and time to students for honing their skills on their own, which will enable them become leading innovators and entrepreneurs. And further he informed the gathering that the EDII will pay special attention for launching awareness and innovation programs exclusively for women. The director appreciated the action taken for targeting the student community into the fold of entrepreneurship development by Sona College of Technology. 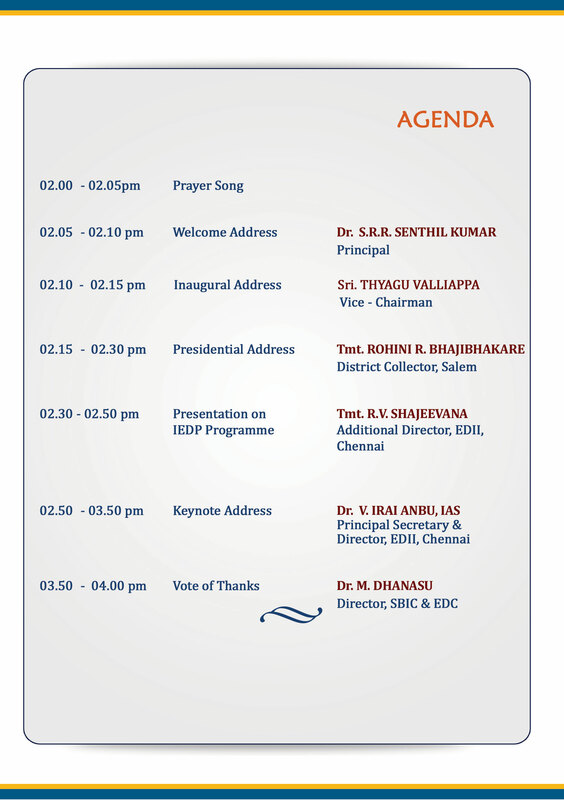 The Top Management Meeting was concluded with lot of fruitful interaction and the Director, EDC & SBIC Dr.M.Dhanasu delivered the vote of thanks and requested Dr.V.Irai Anbu, to participate as chief guest in the brain storming session with students & faculties of spoke colleges in the month of August 2018 as per the convenient time in Sona College of Technology. This entry was posted on June 25, 2018 by admin.